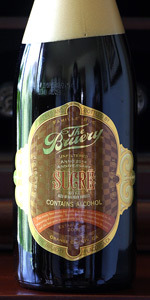 2014 vintage Bourbon Barrel Aged Sucre poured from a 750mL bottle into a Bruery tulip glass. Pours a muddy brown body with a two finger off-white head that reduces slowly to leave a ring of retention, not much lacing. Aromas are Taste is delightful with tons of sweet, decadent notes of brown sugar, burnt molasses, French vanilla, roasty malt, dark roast coffee, bourbon, oak, finishing with a really nice roasted malt flavor that sticks on the tongue for a while. Body is pretty rich with low carbonation. Insanely smooth for 16%. Tasting this makes me wish I bought a whole case back in 2014 when I bought this bottle! Aged very well. Had on tap at Gingerman in NYC. Aroma is rich cherry and vanilla with an underlying malt sweetness. Taste is barrel alcohol with a vanilla sweetness. From bottle at Home. 2014. BIG, Big, big. I'm a big barrel aged fan, but this pushes the envelope. 16.9% ? Had on draft at the Local Peasant in Woodland Hills, CA. Look: Pours a beautiful opaque brown with subtle crimson hints. Small head of light tan foam. Smell: Amazing aromas of Brown sugar, toffee, Bourbon, vanilla bean. Taste: similar to the smell, notes of toffee and Bourbon more prominent. Spicy and boozy. Awesome characteristics. Feel: very light carbonation, super smooth for nearly 17%. Great bourbon stickiness. Crazy good beer. Very well balanced. Highly recommended. A: Pours dark brown with a frothy tawny brown head that settles to a thin layer and leaves a little spotty lacing. S: Toffee, caramel, brown sugar, smooth bourbon, vanilla, and a bit of alcohol, though not sharp or unpleasant. T: Dark sugar, toffee, caramel, brown sugar, vanilla, smooth bourbon, milk chocolate, a touch of spice, and a bit of alcohol which rounds out the flavor. M: Full body, mild carbonation, appreciable warmth which is to be expected from a 16% er, but not unpleasant. A: The beer is black when viewed from afar, but when held up to a bright light it is very, very dark red in color. It poured with a thin off white collar around the edge of the glass. S: Moderate aromas of oaky vanilla are present in the nose. T: The taste follows the smell, having even stronger flavors of vanilla along with some notes of bourbon. O: If you like vanilla flavors imparted by oak barrel aging, this is going to be a very nice beer for you that is pleasant to sip and savor. It also hides its alcohol rather well. 750 ml bottle into snifter, bottled on 2/25/2014. Pours hazy very dark reddish brown color with a 1-2 finger fairly dense khaki head with good retention, that reduces to a thin lace cap that lingers. Light spotty lacing clings on the glass, with a fair amount of streaming carbonation. Aromas of huge raisin, prune, cherry, plum, fig, date, apricot, apple, red grape, sherry, caramel, toffee, brown sugar, molasses, bourbon, maple syrup, vanilla, peppercorn, toasted oak, and brown bread; with lighter notes of coconut, chocolate, cocoa, leather, tobacco, herbal, and yeast/oak/toasted earthiness. Damn nice aromas with great balance and complexity of dark/bready malt, fruity yeast, and bourbon barrel notes; with great strength. Boozy aromas as it warms, but not overwhelming. Taste of huge raisin, prune, cherry, plum, fig, date, apricot, apple, red grape, sherry, caramel, toffee, brown sugar, molasses, bourbon, maple syrup, vanilla, peppercorn, toasted oak, and brown bread; with lighter notes of coconut, chocolate, cocoa, leather, tobacco, herbal, and yeast/oak/toasted earthiness. Light herbal/woody bitterness and bourbon/tannic oak spiciness on the finish; with lingering notes of dark fruit, cherry, apricot, apple, red grape, sherry, caramel, toffee, brown sugar, molasses, bourbon, maple syrup, vanilla, peppercorn, toasted oak, brown bread, coconut, light chocolate/cocoa, herbal, and yeast/oak/toasted earthiness on the finish for a while. Incredible complexity, robustness, and balance of dark/bready malt, fruity yeast, and bourbon barrel flavors; with a fantastic malt and bourbon/oak spiciness balance, with zero cloying sweetness after the finish. Light dryness from bourbon/oak spiciness, lightly increasing through the glass. Light-medium carbonation and full body; with a smooth, creamy/slick, and lightly syrupy/tannic/sticky balanced mouthfeel that is great. Alcohol is very well hidden; a small pleasant warmth with a bit of booziness lingering after the finish, but not overwhelming. Overall this is an incredible barrel aged old ale. All around fantastic complexity, robustness, and balance of dark/bready malt, fruity yeast, and bourbon barrel flavors; very smooth and dangerously easy to sip on for the enormous ABV. A bit more boozy and sweet than previous releases due the higher ABV; but also less earthy/leathery and lacking the butterscotch notes of the past 2 100% BBA versions. More tannic/drying from the barrels. A highly enjoyable offering regardless. Very, very sweet. Glad I just shared a bomber of this with some friends. Not as good as other Bruery beers I have had. The alcohol I didn't think was overly powerful with was surprising for such a high ABV beer. 750ml bottle dated Feb 2014. A: Pours a deep caramel color with a cap of tan foam that faded into a thick fuzzy collar. S: Musty nose full of leather, oxidization, caramel, and tons of raisin. Earthy spice and peppery hop follow, with a touch of tobacco and bourbon. T: Follows the nose, but with an intense punch of strong bitter hop and dark chocolate mixed with boozy bourbon. Leather, caramel, and raisin dominate, but I get hints of tobacco, sherry, and chocolate. Bourbon and sweet candied sugar in the finish. Brown sugar a touch of roasted gain in the aftertaste. M: Full body, slick sticky oily greasy and heavy mouthfeel, tingly carbonation that's slightly sharp. O: Amazing flavor, could be aged longer, but drinks just fine now. Oxidization noticeable but adds to the complexity of the flavor.